I'm not from The South, unless you count Southern California (which you can't), but I've been a resident of South Carolina for almost a decade. It's a place with a culture - which I mostly enjoy from the periphery, not having grown up here. Just this weekend though, I had peek into an unfamiliar slice of Southern culture, thanks to a visit to my friend Lorraine who lives in Atlanta. Lorraine isn't a native Southerner herself, unless you count growing up in Florida (which you can't), but she has lived in Atlanta for some years now. She writes a column for a local Atlanta paper and has authored several books, including a biography of the Southern writer Flannery O'Connor (The Abbess of Andalusia). She had been invited to speak at a local church. I had the privilege of accompanying her, since my visit coincided with her Saturday talk. Her topic was Mother Teresa, so I had that to look forward to, but I didn't realize I was also in for a wonderful dip into a new experience of the South. The talk took place at a Baptist church for their annual "Ladies Salad Luncheon". "What's a 'salad luncheon'?" we wondered. We figured there would be a salad bar and imagined iceberg lettuce, anemic tomato wedges and carrot shavings. This was not to be! Thank goodness. Lorraine knew where the church was because she sang in their Christmas choir concert. She navigated to the parking lot behind the fellowship hall. From the moment of our arrival, every face we encountered was not only smiling and welcoming. I wasn't surprised that they knew Lorraine, but the ladies also greeted me by name. Lorraine had let them know I would be there. We entered a sweetly decorated hall, Christian instrumental hymns played in the background as set up Lorraine's books on the assigned table. Flowers abounded. The organizers all greeted and made sure everything was ready for their speaker. Then began the parade of Southern ladies, mostly mature in years, carrying their salad contributions. The two long buffet tables began to be spread with an impressive variety of salads. I had underestimated the Baptist Ladies Salad Luncheon. There were chicken salads, shrimp salads, pasta salads, deviled eggs, cranberry salad and "congealed salads" - of three varieties! The congealed salads might have been called jello-salads, but here in Atlanta, they were "congeeeeled salad". It's the sort of thing many people today might eschew, much like fruitcake. But these sweet, jiggly refreshment reminded me of family favorites that older ladies could be counted on to contribute. I reveled in the old-world feel. There were at least four of these and I sampled them all. Two "lime congealed salad", one orange colored "ambrosia congealed salad", and a delicious pink congealed salad, the name of which I couldn't make out without my glasses. I was not disappointed that they were all fruity and none contained fish. I've seen that sort of thing in my mother's very old cook books. There was even a token green salad, but I skipped over that. A "Salad Luncheon" - what a marvelous idea! Perfect afternoon potluck fare. It's easy to make, transport and serve and provides a huge sampling of flavors. I'm sold on it! Of course there was sweet tea to drink, though I opted for the unsweetened, that was relegated to the dark corner. Of course there was coffee and lemonade as well. And desserts! Cherry Cobbler, cookies and other confections and pound cake. I learned a piece of Southern trivia at the luncheon. 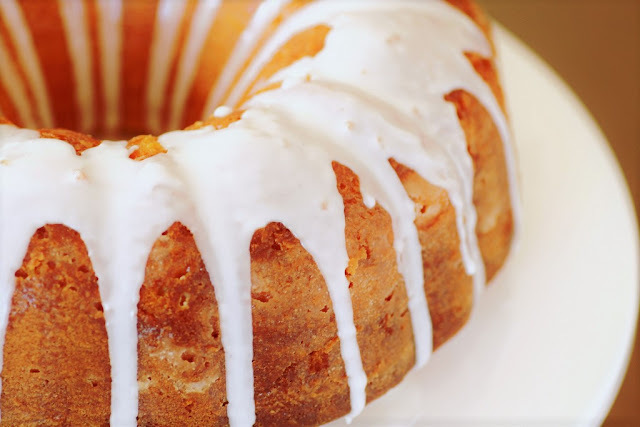 Do you know why Pound Cake has that name? It was originally made with a pound of everything - a pound of butter, a pound of flour, a pound of eggs and a pound of sugar. Naturally, it's a Southern thing as well! Here, for y'all's enjoyment, is a "True Pound Cake" recipe from the website "Our State: Celebrating North Carolina." Beat the butter till light and fluffy. Gradually add the sugar while mixing. Add eggs one at a time, beating only briefly for each egg to ensure it incorporates. [I suppose you could whisk all the eggs together before adding slowly while beating] Gradually add the flour. Do not overbeat. Add flour one cup at a time while mixing. Fold in the optional vanilla. Pour the thick batter into a prepared bundt pan. Eliminate bubbles in the batter by slowly running a rubber spatula through the batter a few times. Place the pan into a cold oven. Turn on the heat to 275° F and cook for 1 1/2 to 2 hours till it tests done. My instructions are greatly condensed from those on the website. See the original for the more detailed version! And the great thing about bundt cakes is that they don't really need frosting, so that's less work! A simple glaze suffices if you want to get really fancy. I might suggest that incorporating each egg, one at a time, might be important. If you have ever watched the batter change as you add each and every egg, one a time a time and beating fully, it's like a whole new batter! I don't know how it effects the outcome, but it certainly effects the batter! As always, I hear your voice as I read. As always, another treat! We need to have a salad luncheon soon. �� Sounds perfect for busy mothers as well! I still remember my mother making some congealed salads back in the day��.